보크사이트를 원료로 BAYER 공법을 이용하여 제조한 수산화알루미늄은 화학식으로 Al(OH)₃ 또는 Al₂O₃ 3H₃O 로 표시합니다 산,알칼리에 쉽게 반응하여 용해하고 열적으로 200℃까지 안정하며 더 높은 온도에서 결정수가 탈수하면 많은양의 열을 흡수하므로 난연재로 널리 사용됩니다. 자유수분 함량과 평균입도에 따라 여러가지 형태의 제품을 다양하게 생산하므로 다양한 중화학공업 분야에 적용할 수 있습니다. WH-50은 3분자의 결정수와 자유수분을 함유한 수산화알루미늄으로 산,알칼리에 쉽게 반응하여 용해합니다. DH-65,DH-50P은 WH-50 표면의 자유수분만을 제거한 수산화알루미늄으로 산 알칼리에 대한 반응성이나 용해성은 WH-50과 동일하면서도 건조상태라 취급이 용이하고 첨가제혼합 등이 간단합니다. WH-50 is a wet hydrate aluminum with three molecules of crystal water and free moisture. It has a very high reactivity to acid and alkali. DH-65, DH-50P is manufactured by dehydrating free moisture from surface of WH-50. Its reactivity and solubility are the same as WH-50 but its state is dry. So, the handling is easier and the mixing with an additive is simpler. SH-8K, SH-15K, SH-25B, KH-8R, KH-17R은 고객의 요구에 따라 별도의 공정을 거친 수산화알루미늄 미분제품으로 점도가 낮아 충전제로 사용합니다. 열적으로 200°C까지 안정하므로 고무, 플라스틱의 난연재로 사용합니다. 난연재로 사용할 경우 온도가 상승하면서 물분자만 방출하므로 유독성 가스나 매연이 발생하지 않고, 내아킹성과 내트래킹성이 우수하여 전기 절연재로 널리 사용합니다. 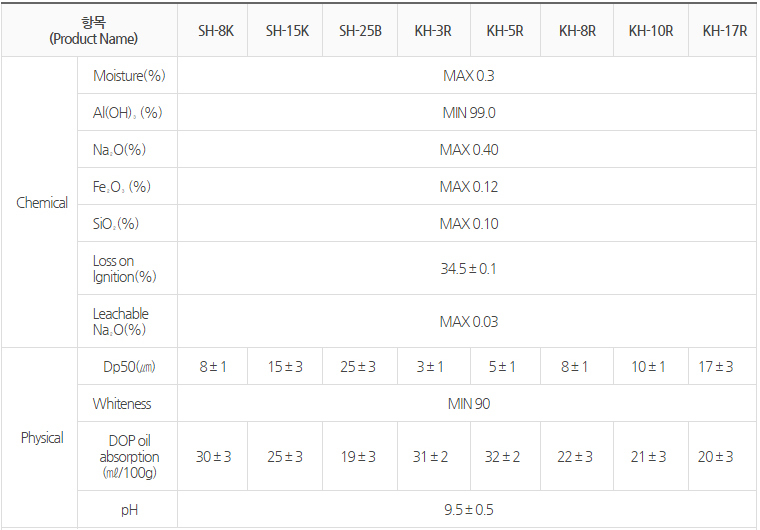 SH-8K, SH-15K, SH-25B, KH-8R, KH-17R are fine aluminum hydroxide made through an additional process per the customer’s request. They are used for flame retardant fillers because of their low viscosity. Being stable to 200°C, they are applied to flame retardant fillers for latex compounds, PVC, etc. As water molecules are emitted without generating toxic gas and dust, the resistance to electrical arcing and tracking is excellent and they are widely used for electrical insulating materials.